Q: I added a tree component with the Head button to the top of a parent tree component – but the tree on top does not appear. A: This is no problem, the tree behaves exactly as it should behave. By default the Node Growth parameter of the parent is set to zero at the top (Standard Curve Parameters – Node Growth), the rightmost control point of the curve is set to zero. This means that a growth of zero is passed on to the child object. In this case, the child object is a tree, which so does not grow. To avoid this, drag the rightmost control point of the parent Node Growth parameter upwards, so that Node Growth at top is bigger than zero. If the tree on top is still invisible, this is caused by a second parameter – Thickness. If the Thickness parameter of the parent tree is set to zero at the top (right side of control curve), then this is passed on to the child object. The child object is invisible, because it´s thickness is set to zero by it´s parent. Please check those two parameters of the parent tree. 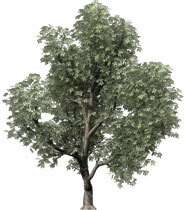 Q: I created a tree or bush with several branching levels, but higher branching levels and leaves don´t appear. A: This is no problem, the tree behaves exactly as it should behave. By default the Node Growth parameter of the parent is set to a range between 50% and 0%. If you build a branching structure with those default settings, the first branching level will grow at most to the half (because the max Node Growth of parent is set to 50%). The first branching level also has a default Node Growth curve ranging from 50% to 0%. The higher you climb in the hierarchy, the less child objects will be produced, because Node Growth is always set to a max of 50%. Node Growth is always passed to the next level of objects and if all tree components of a hierarchy only use a value of 50% or less, then you will get a negative cascade until no branches will appear. Q: Xfrog 3.5 offered a Leaf component, but I can´t find one when working with Xfrog 5.3. A: The old compoenents Tree, Horn and Leaf of Xfrog 3.5 have been combined to one powerful component inside Xfrog 5.3 : the Branch component. So if you are in need of a leaf, create a Branch component and simply replace the circular profile (nurbsCircle) with a flat profile. Q: Xfrog 3.5 offered a Revo component, but I can´t find one when working with Xfrog 5. A: With Xfrog 5.3 you can use all kind of objects as child object. If you need something similar to the Revo component, please make use of the Maya Revolve object. Q: Xfrog 3.5 offered two deformer components, but I can´t find one when working with Xfrog 5. A: With Xfrog 5.3 you can use all kind of deformers that Maya offers. A: Some Xfrog 3.5 models are very complex. Because of this, Evaluation of imported objects is turned off. This gives you the chance to “review” the hierarchy before generating the object. Simply go for the Overall Settings of the parent Xfrog object and turn on Evaluation, then objects will be generated and visible. Q: Xfrog 3.5 offered a Leaf component, but I can´t find one when working with Xfrog 5. Q: Xfrog 3.5 offered a Revo component, but I can´t find one when working with Xfrog 5.3. A: With Xfrog 5.3 you can use all kind of objects as child object. If you need something similar to the Revo component, please make use of the Cinema Lathe NURBS object. Q: Xfrog 3.5 offered two deformer components, but I can´t find one when working with Xfrog 5.3. A: With Xfrog 5.3 you can use all kind of deformers that Cinema offers. If you need something similar to the Hyperpatch component, please make use of the Cinema Free Form Deformation object. Q: I added a tree component with a simple link to a parent tree component – but the tree on top does not appear. A: This is no problem, the tree behaves exactly as it should behave. By default the Growth Scale parameter of the parent is set to zero at the top, the rightmost control point is set to zero. This means that a growth of zero is passed on to the child object. In this case, the child object is a tree, which so does not grow. To avoid this, drag the rightmost control point of the parent Growth Scale parameter upwards, so that Grpwth Scale at top is bigger than zero. If the tree on top is still invisible, this is caused by a second parameter – Shape. If the Shape parameter of the parent tree is set to zero at the top, then this is passed on to the child object. The child object is invisible, because it´s thickness is set to zero by it´s parent. A: This is no problem, the tree behaves exactly as it should behave. By default the Growth Scale parameter of the parent is set to a range between 50% and 0%. If you build a branching structure with those default settings, the first branching level will grow at most to the half (because the max Growth Scale of parent is set to 50%). The first branching level also has a default Growth Scale curve ranging from 50% to 0%. The higher you climb in the hierarchy, the less child objects will be produced, because Growth Scale is always set to a max of 50%. Growth Scale is always passed to the next objects and if all tree components of a hierarchy only use a value of 50%, then you will get a cascade until no branches will appear. Q: I added an Attractor component, but nothing is visble and no deformation happens. A: First, the Attractors only are visible, if the Model View is told to display them. So please check the Menu: Display, Show/Hide Attractors. Second: you need an additional component, for example a Simple component with Primitive Type set to Attractor. Both, the Simple component and the object to deform have to be child objects of the parent Attractor component (which is automatically renamed to FFD in the hierarchy window). Q: I would like to edit the materials of Xfrog plants and use my own textures (for example leaves with snow), is this possible. A: Yes, it is. Xfrog plants come with high quality textures, but if you want to replace with custom materials, you are welcome. Simply edit the needed material parameters or replace bitmaps with your own textures. Q: I like the Xfrog plants, but is it possible to edit the plants and create custome variations. A: Yes and no. Xfrog plants are created with Xfrog for Windows, a standalone modeling application specialized on organic shapes like trees, bushes and flowers – but also abstract architecture. Xfrog Plants DVD´s also contain the original Xfrog files of the plants. So if you own Xfrog for Windows, you can edit the plants, save them as Xfrog file and also export to common 3d formats like 3ds and obj. Those files can be imported to Vue. So plants can’t be edited directly inside Vue, but you can edit plants with Xfrog for Windows and then export back to Vue. Q: Vue 5 Infinite and above offers wind in it´s own plants. Is it possible to use wind on imported objects like Xfrog plants? A: No, unfortunately not. Wind only works with built in Solid Growth plants, not on imported objects. Even when you bake a Vue Solid Growth plant, wind won´t have an effect on this object any more. Q: I heard that Xfrog plants always eat a lot of memory and CPU processing power. A: Again, yes and no. With Xfrog you can build the complete range, from lowpoly objects to extremly high detailed objects – it´s up to the user. If you are user of Xfrog for Windows you easily can adjust the level of detail of Xfrog Plants. You can increase the detail for close ups and export the plant, it´s also possible to lower the detail and export the object.